The Data usage application shows how much data you have used and which applications or services are responsible for your data usage. You can set mobile data limits, view Wi-Fi usage, restrict background data usage, and turn data roaming usage on or off. 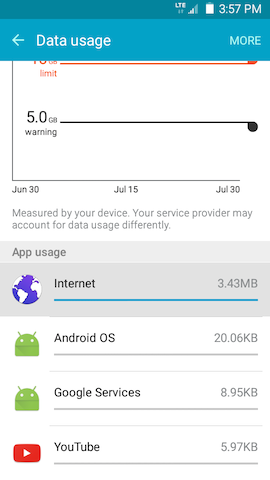 Data usage shown in the Data usage application is measured by your mobile device. Your wireless service provider's data usage accounting may differ. 3 Scroll down and touch Data usage. 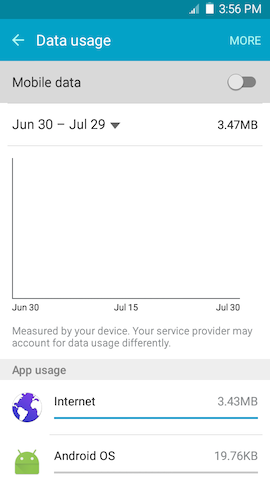 4 Your device will display your data usage for the current cycle in GB or MB, along with a graph of this usage. View data usage for individual applications under the graph. 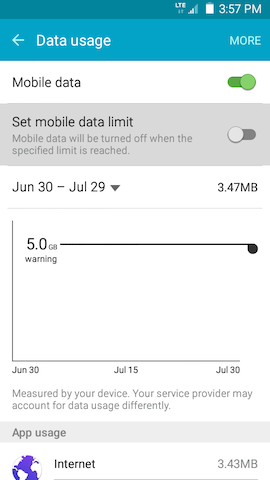 5 Touch the slider next to Set mobile data limit to turn on the data usage limit. 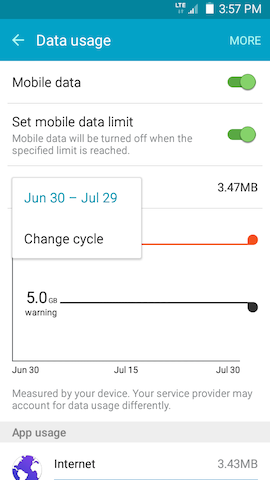 Touch on the right side of the graph, and drag it up or down to adjust your data usage limit. 6 Touch on the right side of the graph, and drag it up or down to adjust the data usage warning limit. 7 To change the data usage cycle shown in the chart, touch the date range displayed and touch Change cycle. 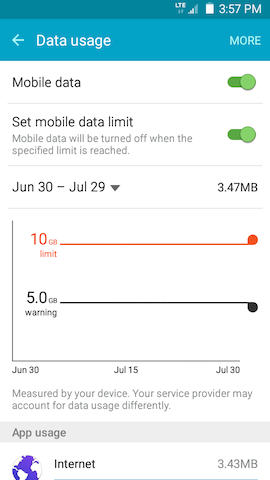 When you have reached your mobile data limit, you may receive a message about your data usage. 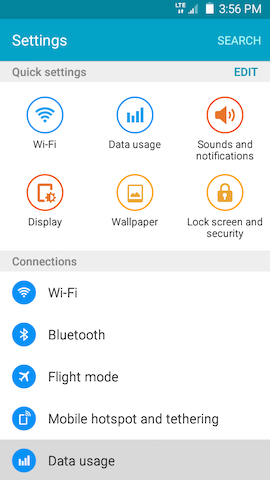 If your mobile data connection has been turned off, you can turn it on anytime by touching the notification about mobile data in the Notification Panel. 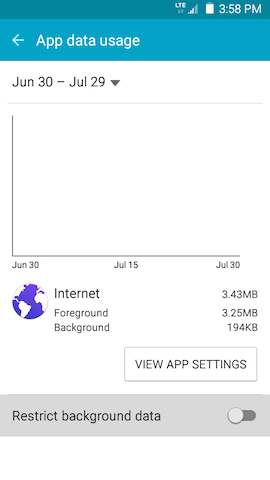 • Restrict background data: Restrict your device's use of data for background tasks unless it is connected to a Wi-Fi access point. • Show Wi-Fi usage: Show an additional tab covering the Wi-Fi data usage on your device. • Restrict networks: Select Wi-Fi networks that are mobile hotspots. Applications can be restricted from using these networks when in the background and can also warn you about using these networks for large downloads. The list of applications shows you applications that have used data on your device and how much data each application is responsible for during the data usage cycle selected. 1 From the Data usage application, scroll to and touch an application to get more information about it. 2 Scroll to and touch VIEW APP SETTINGS to view options for the application. Scroll to and touch the slider next to Restrict background data to turn it on to turn off background data for the application individually. The VIEW APP SETTINGS option may be unavailable and grayed out for some applications. How can I adjust the screen brightness and timeout on my Galaxy Grand Prime?